This episode gives us good old fashioned father-son bonding moments – this being Vikings, that involves arson, a pitched battle, and a beheading! The main story of this week’s episode has Ragnar going to war with Jarl Borg to take back Kattegat. The plan involves Ragnar, Bjorn and a couple of other men going back to the town, where they burn down the grain supply buildings, which they hope will draw Jarl Borg out into the open field. It all leads to an intense battle – one of the best to be depicted so far in this series – ending with the Jarl fleeing. Although Bjorn does kill several men, he is knocked over at one point, and his father later upbraids him for his failure. Later on, after Kattegat is retaken, one of the enemy prisoners is set to be executed by Rollo (as a sacrifice to the gods) but Ragnar intervenes and has Bjorn perform the deed. One could look at it as a father trying to ‘toughen-up’ his son, perhaps because he has taken to heart what The Seer has told him about the young man having a glorious future. 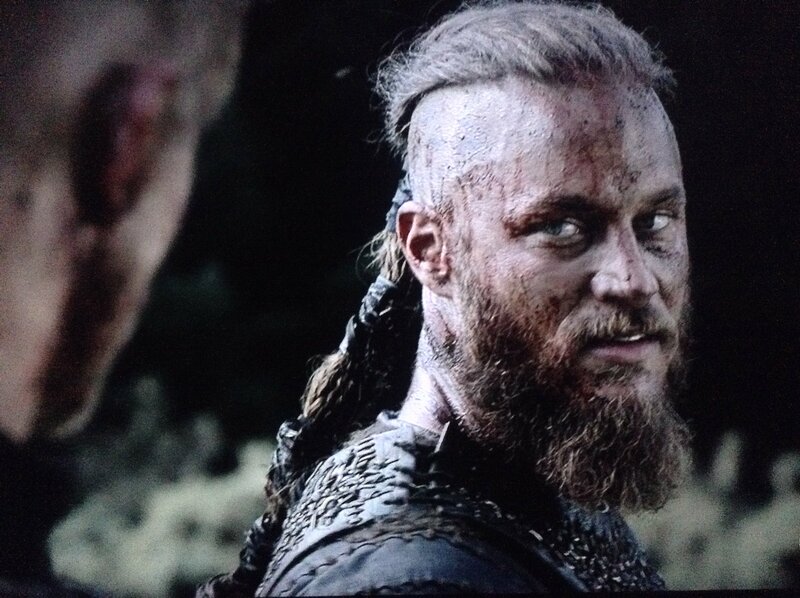 Travis Fimmel does a good job in this episode – he gives off the sense of being a cool, cocky leader, especially when he is in his element (in battle). However, when it comes to women, he still seems flustered and his hopes of having both Aslaug and Lagertha in his bed soon unravel. The second major story has Athelstan, still bearing some marks from his crucifixion, either being tormented by visions as part of his crisis of faith, or just going crazy. This second storyline was not as compelling or interesting as the main one, as Athelstan has little to do but go around seeing visions. Part of the problem is that he seems to be plagued by these visions in almost every scene – instead of him expressing his feelings and delivering what could be some good lines about his internal struggle of faith, he spends most of the time just looking bewildered or mad as he sees what he thinks is the Virgin Mary or a demon coming towards him. That said, this episode largely delivered what we can expect from Vikings – a good battle scene followed by a little romance and intrigue.